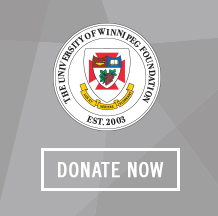 Every gift to The University of Winnipeg Foundation makes a difference and every donor matters. In addition to the obvious rewards of knowing your donation is helping a student in need or a discovery in the making, we invite you to be part of something exclusive — a club, an event, a published list recognizing our donors, or all of the above. For more information on stewardship and recognition opportunities at The University of Winnipeg, please contact Jolene Deere at j.deere@uwinnipeg.ca.